Please join members of Halifax's transgender community, their friends, families and allies in marking the 15th Transgender Day of Remembrance (TDOR). This year’s event will be held on November 20th, at St. Matthew’s United Church, 1479 Barrington Street, Halifax. Doors open at 6:30 pm with a 7:00 pm start. The Halifax event will also include a community update on issues affecting the Trans* Community and an update on the activities of groups serving the Trans* Community. 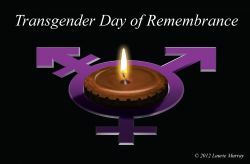 TDOR, held annually on November 20th, is an internationally recognized day to memorialize those who have been killed as a result of transphobia, or the hatred or fear of transgender and gender non-conforming people, and acts to bring attention to the continued violence endured by the transgender community.